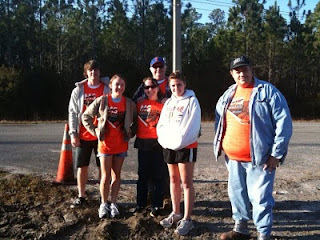 Saturday, my family and I woke up early to volunteer all day at the 2010 MS Mud Run. The National MS Society website describes the mud run as "...a 10K (approximately 6 miles) race with boot camp style obstacles that have been surrounded by or consist entirely of mud. People cheer as teams of contestants slip, slide, and slosh their way to victory". It was very interesting to say the least. The station we manned was the first obstacle. The contestants ran 3/4 of a mile then low crawled through a pit of mud and water. I think I might like to try something like this some time, but I would have to be in much better shaped! Some of the people looked like they were about to pass out at our obstacle (and it was only the first of many!). You can see pictures of last year's Mud Run at http://eventfln.nationalmssociety.org/site/PhotoAlbumUser?AlbumID=124052&view=UserAlbum. The money raised during this event went to the the National MS Society to help those affected by multiple sclerosis. Also, next time I plan on being outside for 8.5 hours I will be smart enough to wear sunscreen. My arms, face, and legs are burned to a crisp. 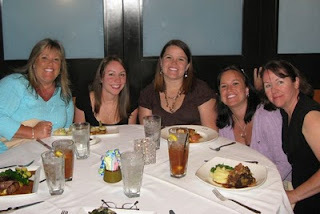 Saturday night the girls went out to celebrate Ms. Karen's B-Day at Roy's! We had such a great time celebrating! When we got to the restaurant and opened our menu's they had put an insert in with Ms.Karen's name, happy birthday in Hawaiian, and the date. What a great surprise! All of the food was amazingly delicious! We can't wait to go back again! After our dinner, we returned home to finish the night off with red velvet cheesecake from the Cheesecake Factory. If you haven't had this cake you have to try it! You will get addicted for sure! 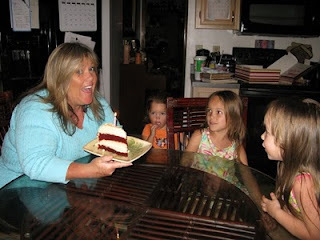 HAPPY BIRTHDAY Ms. Karen!